Blog - Is there anything wrong with using a free blogging service? Is there anything wrong with using a free blogging service? Many starting out in blogging are faced with the choice of whether to go the self hosted route or remote hosted or free hosted route. Professional bloggers will encourage you to opt for the self hosted route, with some good reason. But is there anything wrong with a free hosted blog. There is nothing wrong with free hosting. One just has to understand the Pros and Cons, accept them and you are A for away. Read my article Which is better Blogger.com vs Wordpress.com? Problem is you are limited in certain areas. Not much flexibility to customise your blog. Most have limited Themes or skins. Monetising is limited, for example Wordpress.com does not allow for adverts. Also, some make backing up and restoring your data very difficult, sometimes impossible. With a self host you get more control. 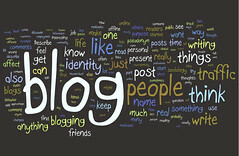 More ways to customise your blog. You can monetise your blog any way you choose to. In fact you can control everything. You can place advertisements, back up your data, export data, run analysis, or even sell your blog. You own the domain and all the content within it. The disadvantage is that blogging is not free. Having a self host costs money. You have to pay or rent space from an ISP host. You have to pay for your own domain. There is a learning curve involved. Another thing that many people do not realise on free blog hosting sites like Wordpress.com, is that when you do want to move to a self hosted blog, taking your PageRank and back links is very difficult because Wordpress.com does not offer a 301 redirect. It really all depends on your niche, your goals. Hosted blogging is a great solution for people who are looking for a free or inexpensive blogging solution and don’t want to hassle with many of the technical details of blogging. However, they should be aware that there may be certain limitations regarding the design of their blog, the ability to earn money with their blog, or the ability to sell it in the future. But don’t think that a hosted blogger is not a serious blogger. Having a free hosted blog might just mean that it is perfect for your needs. As long as you understand the pro’s and con’s you are A for away. Self-hosted blog for anyone who plans on making a serious attempt at blogging, has plans on making money with their website, wants total control of their website, or wants the option of selling their website in the future. If you have plans on starting a blog that will be highly trafficked and will hopefully make money, then I strongly recommend purchasing your own domain and web hosting package. Can I be a serious Blogger on a free hosted blog? The unequivocal answer is YES you can. I sound like Obama don't I. But seriously you can be serious. The question one has to ask is, what makes a blogger serious? Is it how much money they make blogging? Is it that they have their own domain? Is it their Alexa or PR ranking? Is it their commitment to blogging? Is it their consistency to their blog? Is it their level of engagement that they share with their readers? Is it the amount of comments one gets on a blog? Is it the amount of readers or RSS subscribers? What is it that makes a blogger and a blog serious? Is it any one of these or a combination of some or all? of, showing, or characterized by deep thought. of grave or sombre disposition, character, or manner: a serious occasion; a serious man. being in earnest; sincere; not trifling: His interest was serious. requiring thought, concentration, or application: serious reading; a serious task. weighty or important: a serious book; Marriage is a serious matter. giving cause for apprehension; critical: The plan has one serious flaw. Medicine/Medical. (of a patient's condition) having unstable or otherwise abnormal vital signs and other unfavourable indicators, as loss of appetite and poor mobility: patient is acutely ill.
that which is of importance, grave, critical, or sombre: You have to learn to separate the serious from the frivolous. I think there is more to a serious blogger than just being self hosted. Some of the worst blogs I’ve seen are self hosted. A serious blogger is one who is consistent with their posts. Has a great knowledge on the subject that they are writing on. Has a passion for blogging and the subject matter or niche of their choice. In always engaging with their readers and followers. Is earnest and sincere. The choice really is up to you. All you have to do is way up the pro’s and cons and make your choice, live with it and be Happy. Don’t let anyone tell you that you cannot be serious. Although having said that, if you do have opportunity and the cash to host your own blog, then there is nothing wrong with doing so. Just make sure that your motivation is correct and that you are not trying to fulfil someone else's dream. So what are your thoughts. Are you self-hosted or free hosted? How do you feel about that. What do you think are the pro’s and con’s of either as they apply to your needs? Have you ever been pressurised into choosing one hosting type above the other? Which one do you prefer and why? Please leave your thoughts in the comments below, we would all be interested in what you have to say on the subject. Re: Is there anything wrong with using a free blogging service? @Firas: This is EXACTLY what has happened in my case! I started blogging a year ago just to see how far I could go and am now pulling my hair out from not being able to realise my blog’s monetizing potential by getting adverts etc. I think this happens to a lot of bloggers.